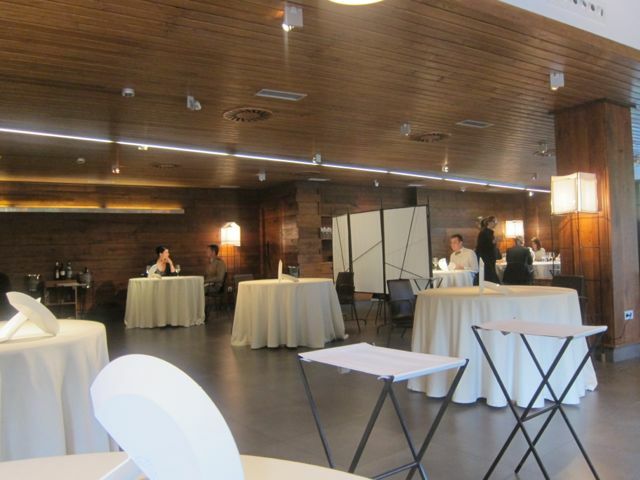 It was as if I started Mugaritz just yesterday, but shockingly enough a year has gone by. 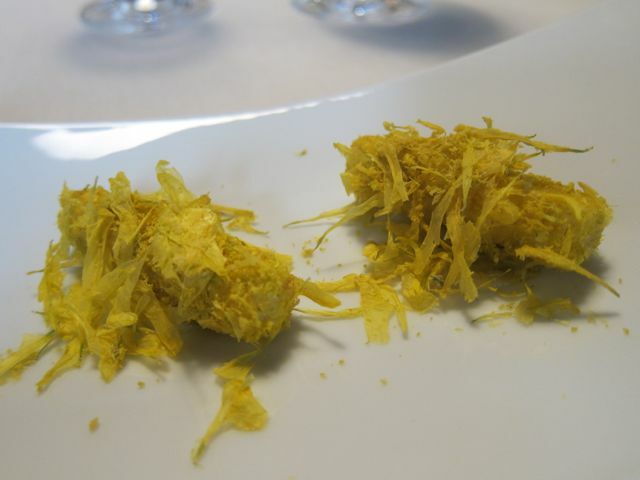 This past Sunday, I finished my experience at Mugaritz (2* Michelin, San Pellegrino’s 3rd Best in the World 2012) ,headed by Chef Andoni Luis Aduriz and chef de cuisine, Julieta Caruso. It has been an eventful year for me, moving to Spain, learning a new language, trying to work in that same very language, living in the foothills of the mountains (for a city girl that is rather difficult) and just absorbing my surroundings. I remember very clearly my first day. It was a Tuesday, and the team started with a daily reunion (usually at 10 am) but on Tuesdays, at 4.30pm. I had my back to a wall and just stayed there as I watched all the other cooks walk in a rush, getting some of their mise-en-place done. “Buenos Dias” was said by all and then started the meeting. At that moment, I asked myself why was I here? And started questioning my decision but I knew it was just fear, excitement, happiness all just mixed up in my head. 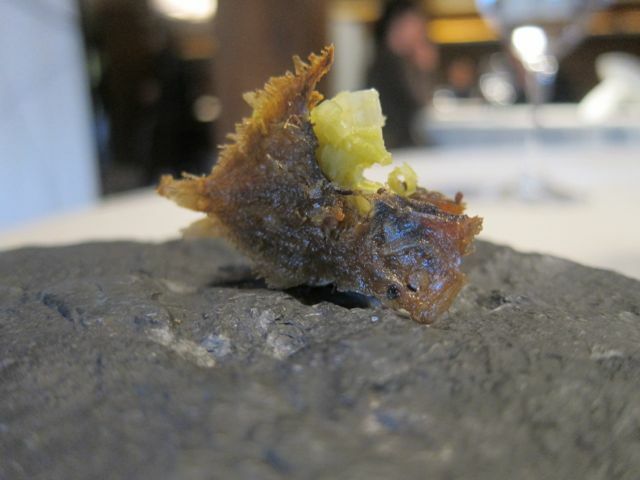 This blog post is not going to outline in detail my experience in Mugaritz for the past year, but before I get to proudly showcase what Mugaritz is all about gastronomically, I would like to say that it is bittersweet writing this blog post. 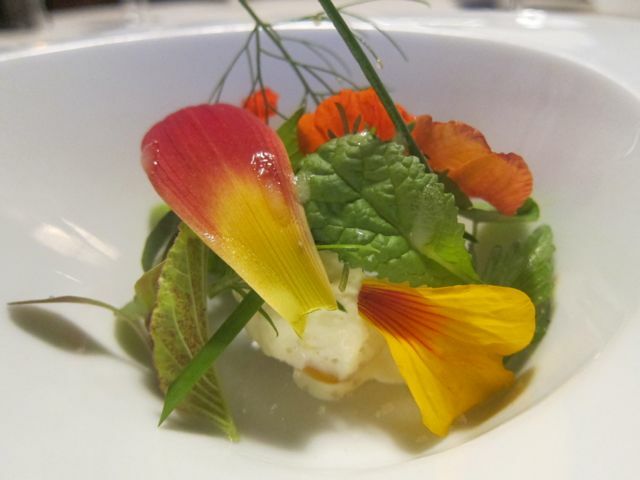 First, because I wish I was still in the kitchen, getting mise-en-place done, being in service, just being with the ‘team’ but secondly, I know it is time to let the new season take its own ride with the new cooks that have arrived in April 2012. I wish them the best of luck, I know they will be part of Mugaritz as much as I became and that in the end, Mugaritz will always be a part of them. 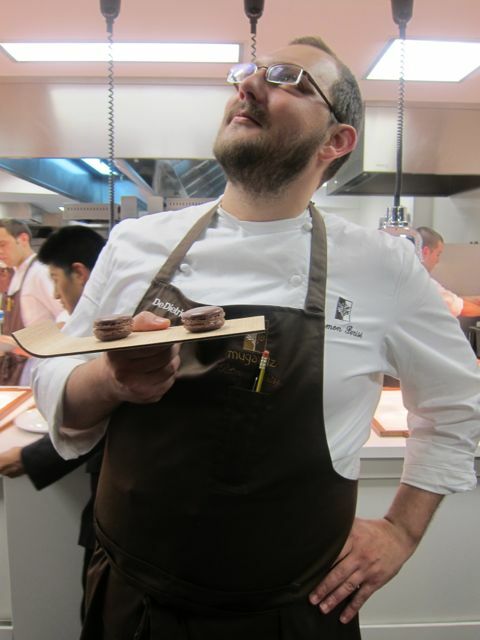 The night before I left San Sebastian, I decided to have a diner at Mugaritz, as a way to see all the work and accomplishments I got to be part of during my time there. 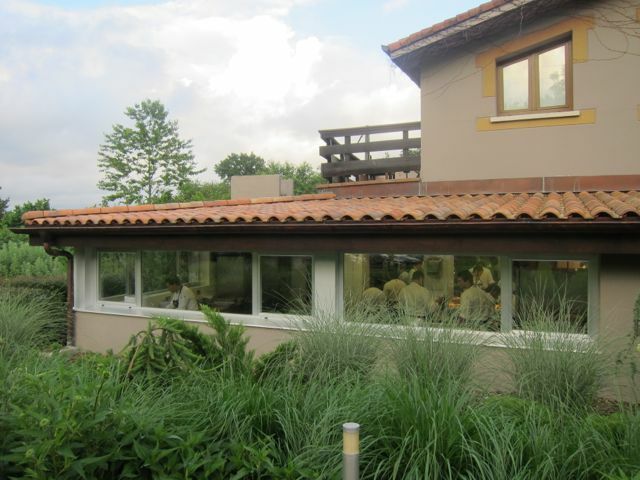 Mugaritz is situated in the foothills outside of San Sebastian. 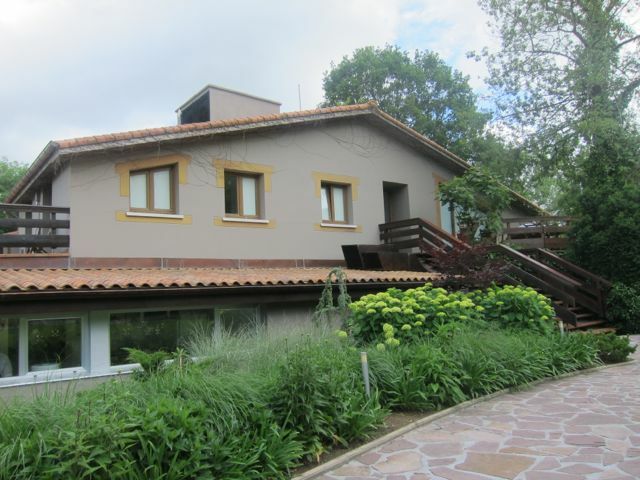 Situated on the border between the towns of Errenteria and Astigarraga, it is completely surrounded by nature. 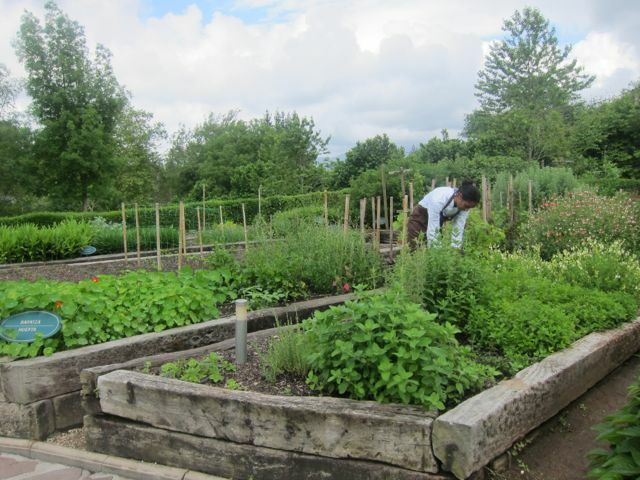 The complex boasts a huerta (herb garden) where daily, chefs will pick flowers, plants and herbs to enhance an ingredient, a plate, an experience. As you enter the area, you walk by large windows where cooks are walking left and right, doing mise-en-place by the window, all within the sound of nature from the outside. Boy, does it sure sound different from the inside. It’s almost as if you’re watching a silent movie. 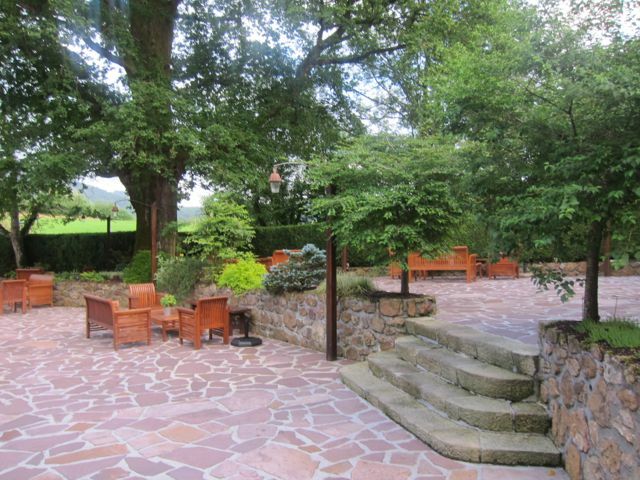 You then find yourself greeted by a leafy courtyard where clients can enjoy pre-dinner drinks and some aperitifs. It was a bit chilly that day, so opted to start the dinner inside. 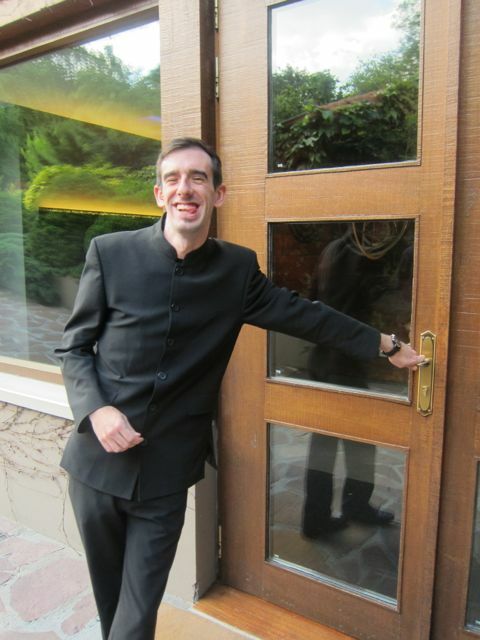 This evening, Zigor, escorted me into the darker and sleek dining room. When I write ‘dark’, I don’t mean somber, there’s just a huge contrast between the outside and the interior. 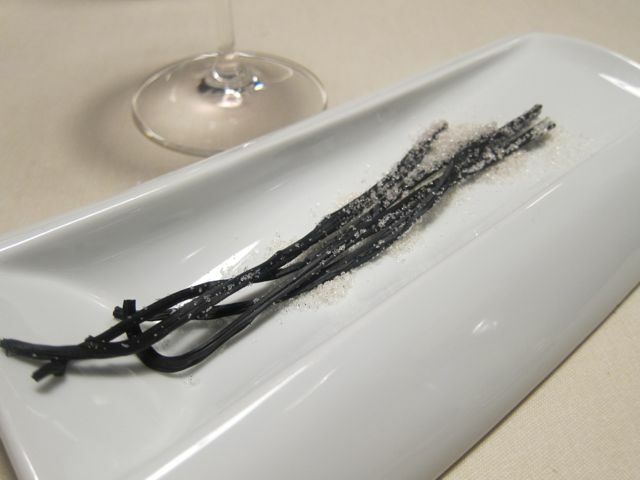 The waiters wear black and silently walk through the dining room without being noticed, the woods used to decorate the dining room are ‘survivors’ of the Mugaritz fire a few years back and the walls of the room are plain. 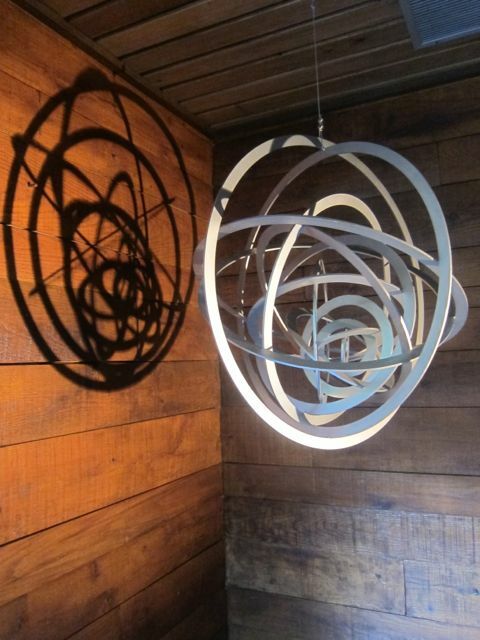 The decoration is restrained compared to the outburst of nature and colors on the outside. 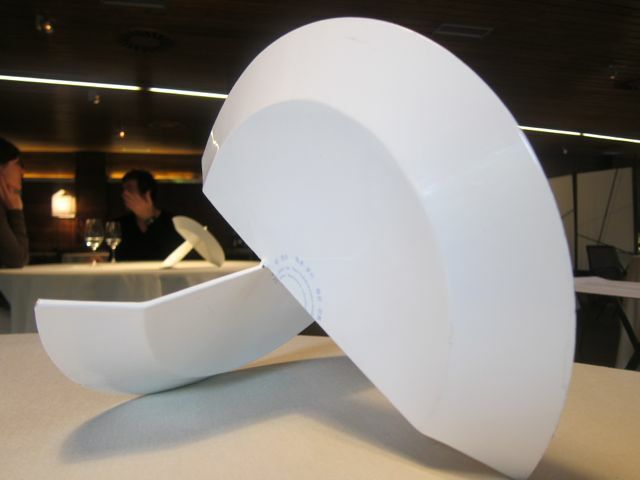 In front of you, is a dinner plate broken in half and then pieced back together, as a memory that the restaurant will continue despite a tragic accident. What I noticed was a quiet dining room, people were talking to each other normally, but it seemed like murmurs and whispers. 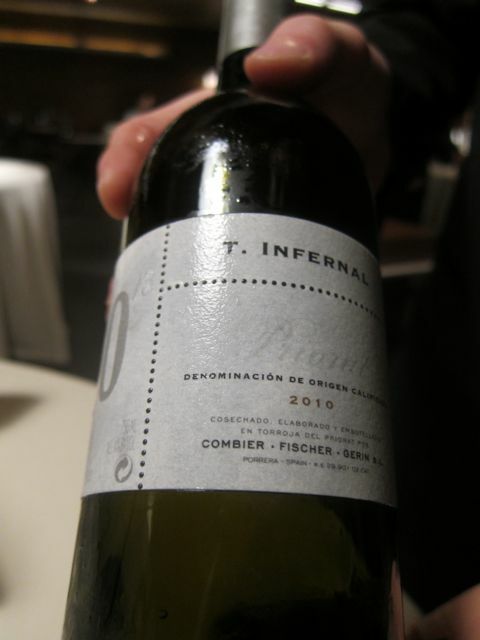 The room boasted a smoked grape vine odor that seemed naturally pleasant with the surrounding. Waiters come and go through a side glass door, and every time it opened, I could here the works of the kitchen and the commands being announced for every table. What a contrast. Ok, let’s not get emotional now. Wait until the meal is over! 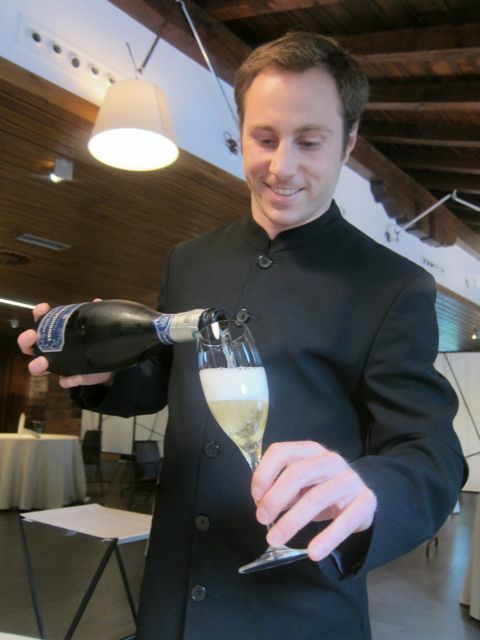 Romain, one of the 3 Sommeliers in Mugaritz, invited us to a glass of Champagne before our meal started. Don’t mind if I do! 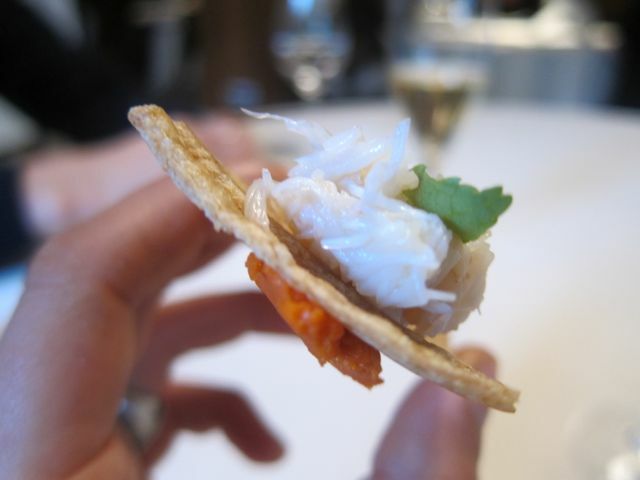 At Mugaritz, every table begins with a Secuencia de Manos (I guess the translation would be Sequence of Hands, or Hands sequence, but that does not make any much sense…). Basically it is several finger-food dishes – no forks or knives, where only a napkin is placed by your side and wet towels are handed to you at the end of the secuencia. 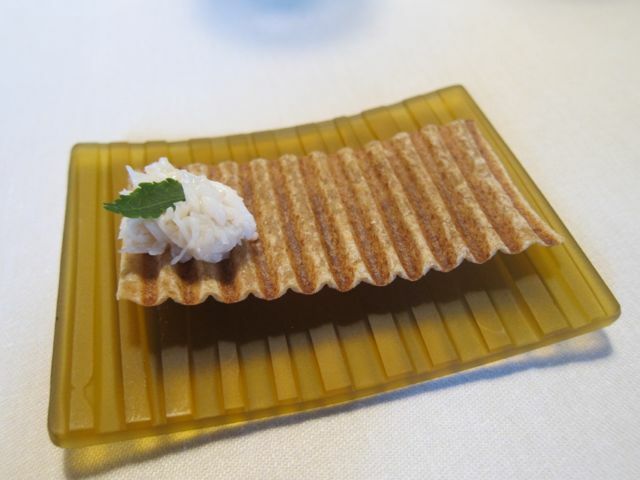 I was a bit way of this dish, not knowing what to expect. I know anemones are sea-dwelling creatures that have dangling feet just like jelly fish. They were warm, a little gooey and tasted like the sea. Surprisingly welcoming. 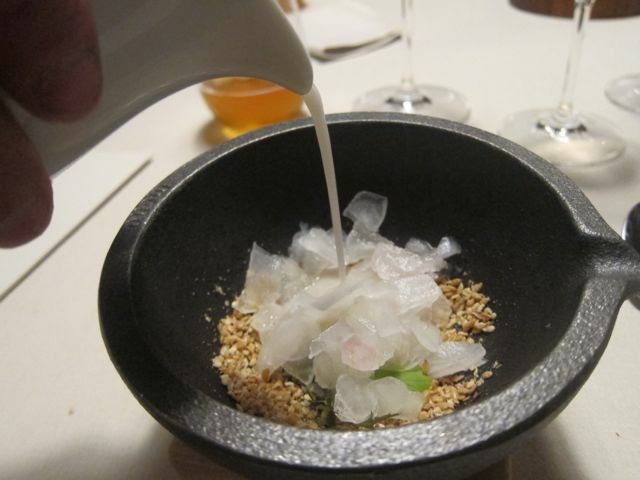 Esparrago Blanco – White Asparagus, Chrysantheum leaves, Almond powder, pork fat. 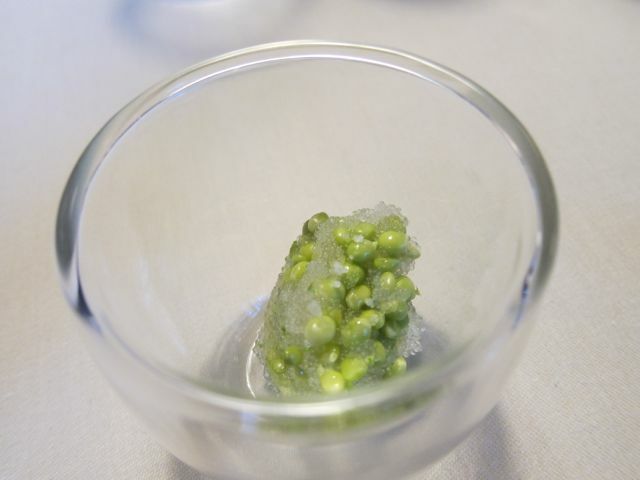 Crunchy and tempered asparagus, that provided a bitter but balanced taste to the more sweet almond powder. Huevas de Besugo: Sea bream eggs with fresh baby peas. 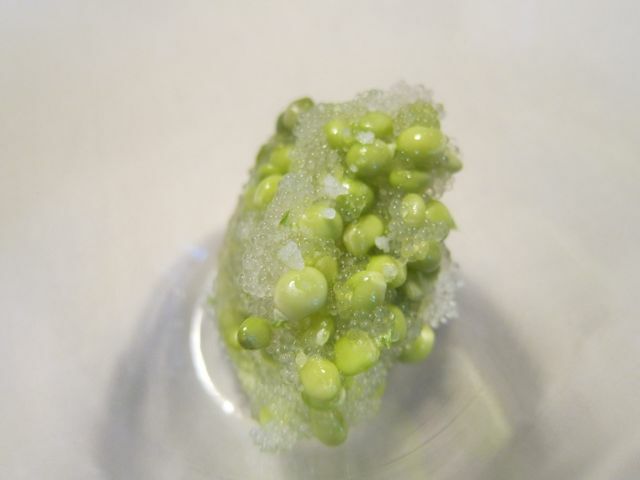 Crunchy peas with popping fish eggs in your mouth. What a duo. 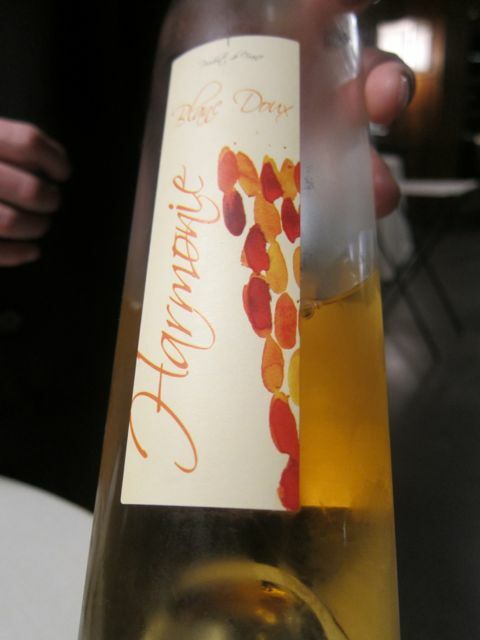 Accompanied by a glass of Manzanilla wine, a variety of vino sherry from southern Spain. 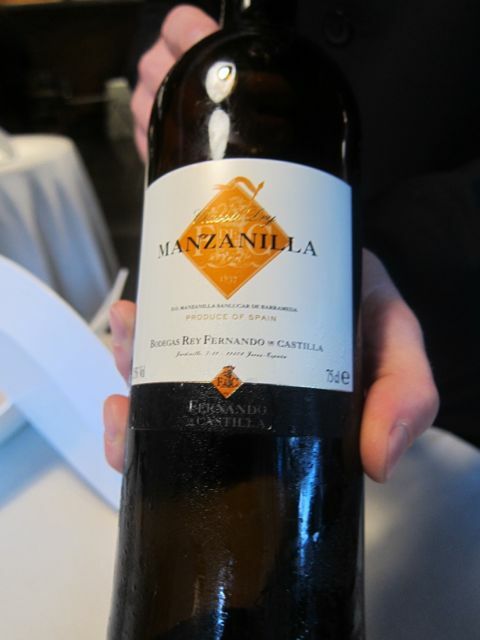 Manzanilla in Spanish literally means Camomile, as the wine’s flavor is reminiscent of such tea. 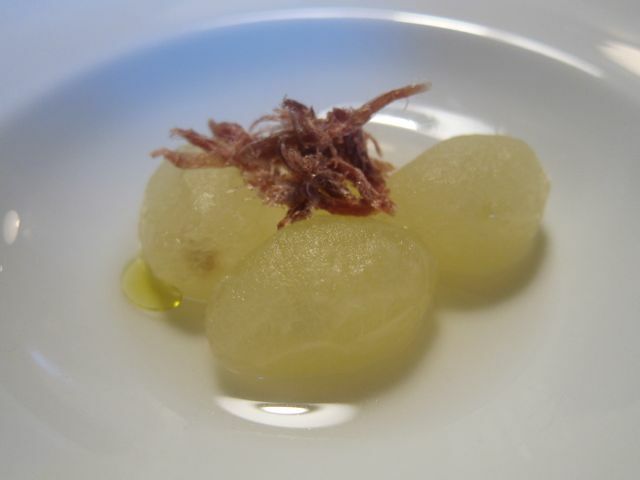 Uvas (literally meaning grapes – but these are grapes of melon and spices seeds (cardamon, juniper berry) topped with dried tuna. 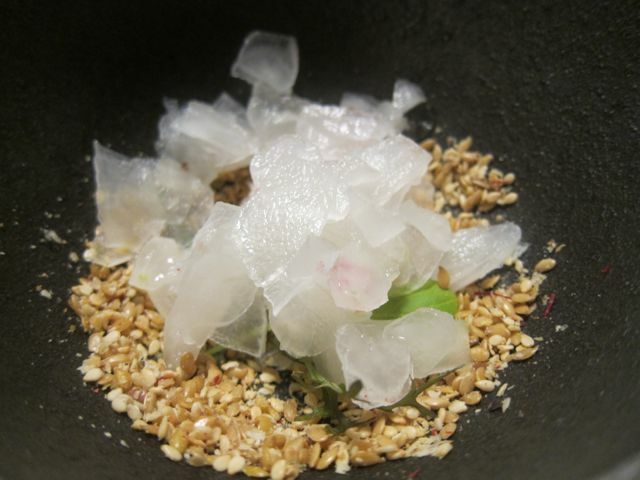 Foie (foie gras cured in kaolin, resting on a clear concentrated apple juice). 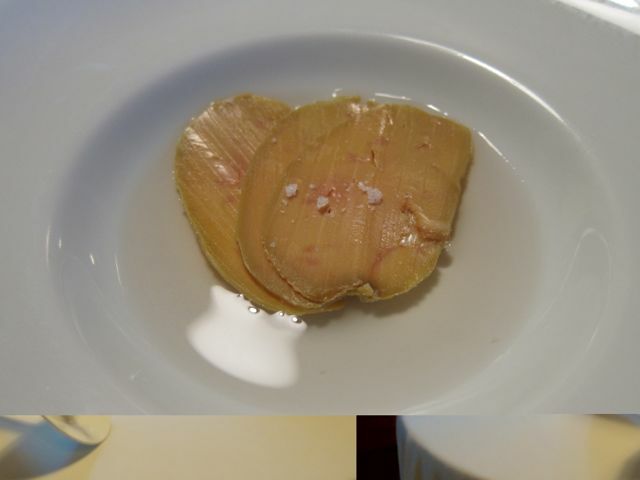 The foie melted in your mouth and had just amount of salt, while the apple juice was so strong and added the fresh, sour, sweetness you needed to combine with the foie. 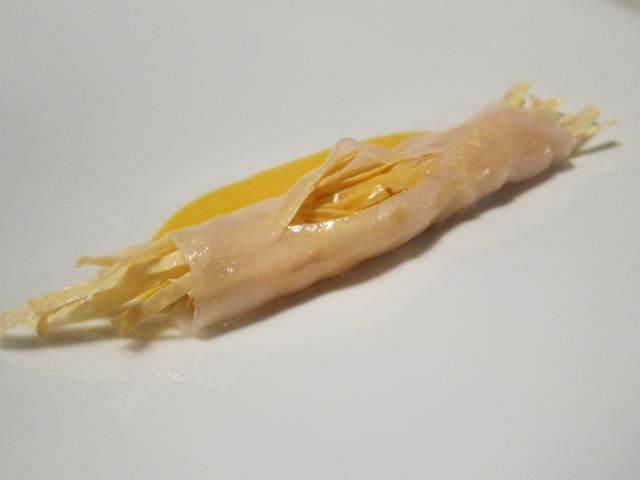 Fideos: Milk ‘noodles’ wrapped in Iberico pork fat (bacon) with pumpkin and tomato sauce. Melt in your mouth bacon with the crispy milk skin noodles, and the sauce to give it all a taste. 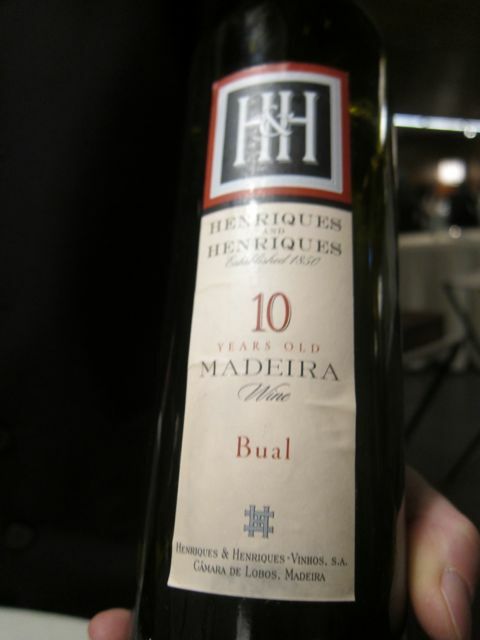 With a glass of Madeira. 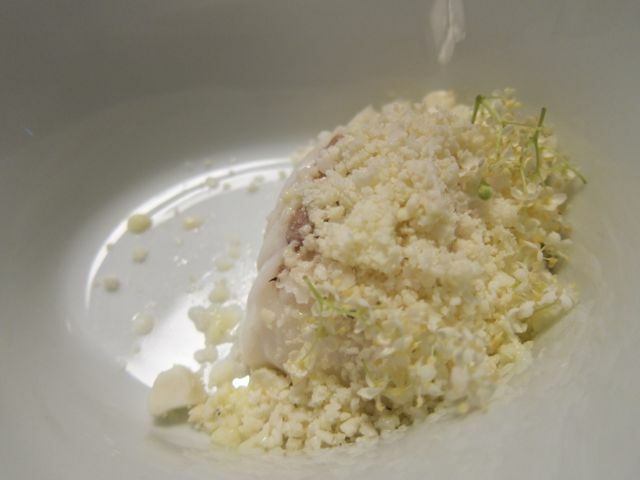 Coliflor: Hake fish, lightly cooked, with fine cauliflower and mascarpone powder. My favorite fish dish. 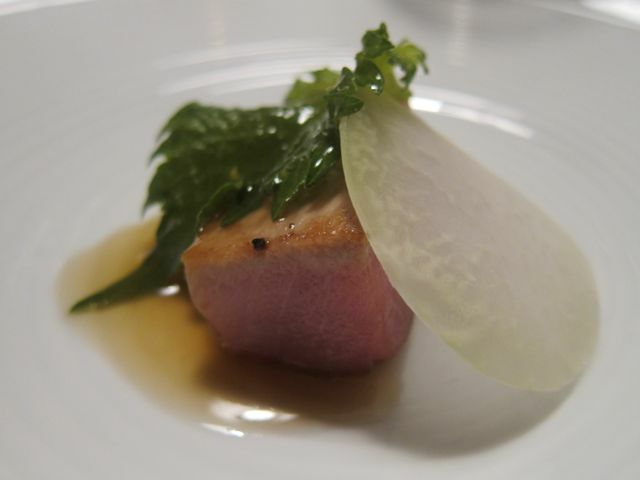 Atun (to be exact, tuna belly). This is not usually on the menu but it just came in fresh and we got the chance to sample it. Kissed by the fire on one side and left tempered and raw on the other, on a reduced fumet. Wow. Both fishes were accompanied by the 3 Infernos. Mortero: Mortar. 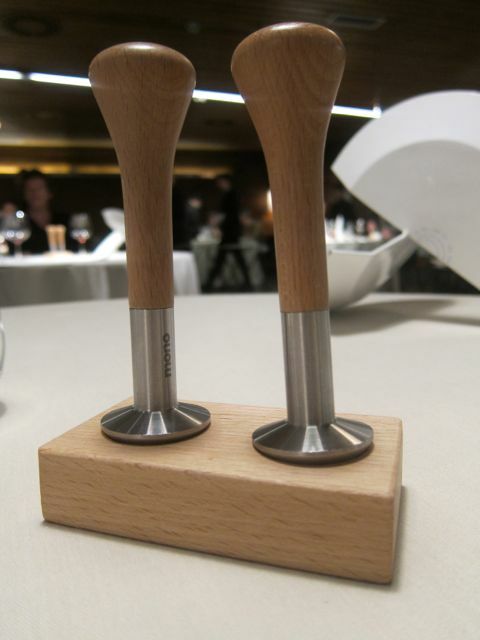 Every table receives pestles. 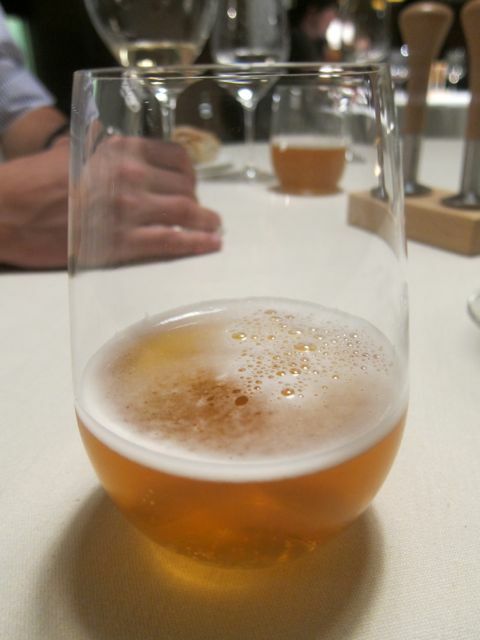 Now, we stop for beer. 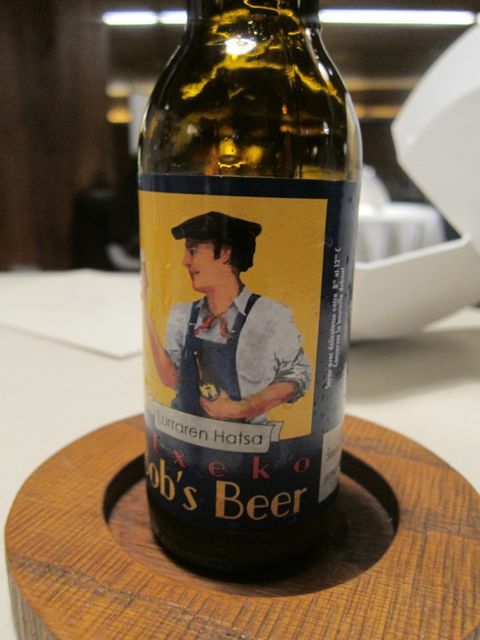 Bob’s Beer to be exact. 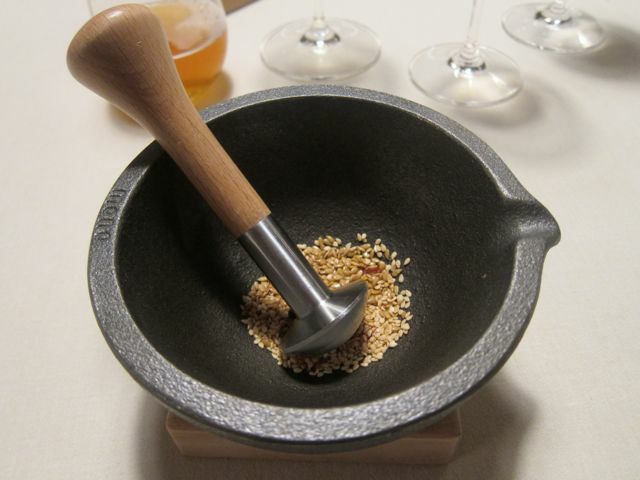 Mortar and Pestle: Toasted sesame and flax seed, peppers and saffron. 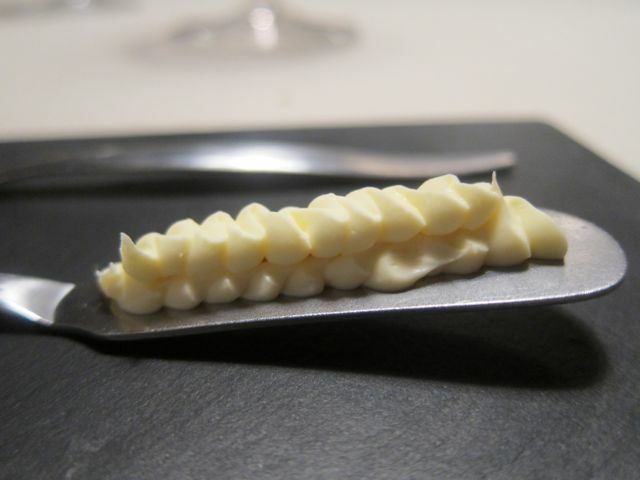 Once you receive this first part of the dish. You’re meant to pound and mix the seeds as much as you’d like your soup to taste. Once you start, so does everyone else to your surprise and the entire room is filled with different sounds, clients looking at each other in surprise, excitement, some taking pictures, others filming. The rhythm seems to be both improvised and in sync. One moment in the restaurant where everyone comes together. Fresh radishes and mustard leaves, sunflower seed soup to add. 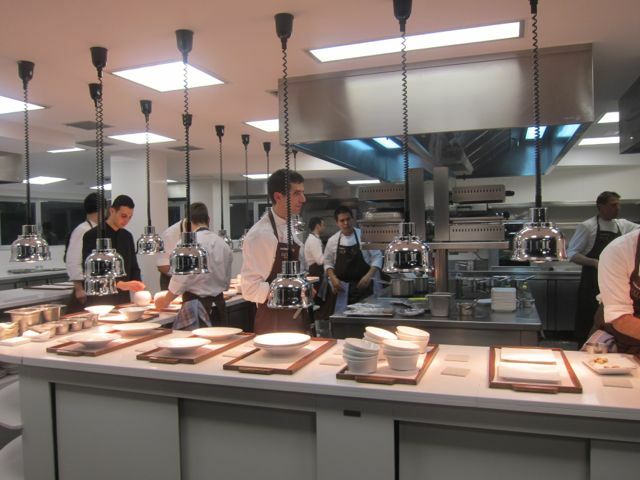 Every table also enters the kitchen to speak with the Chefs, to get a view of what’s going on ‘inside’ and to learn how the kitchen functions. 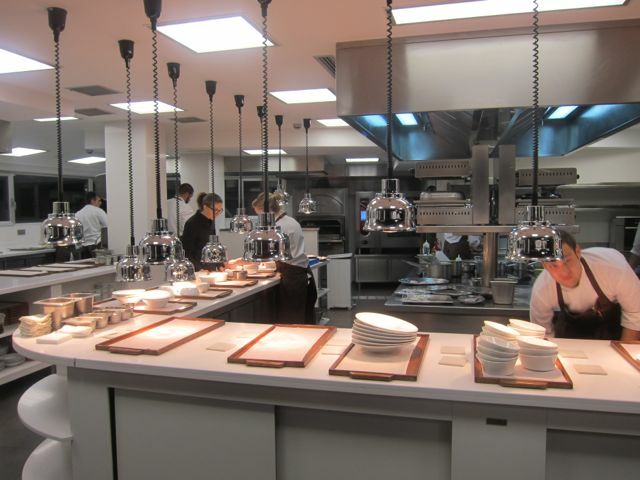 This year, clients get to sample one of the dishes right in the kitchen. 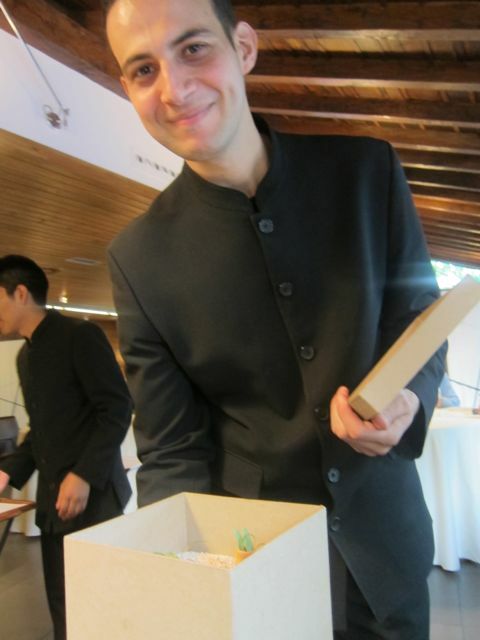 Ramon, a member of R+D team handed us out the Macaron (Macaroon). 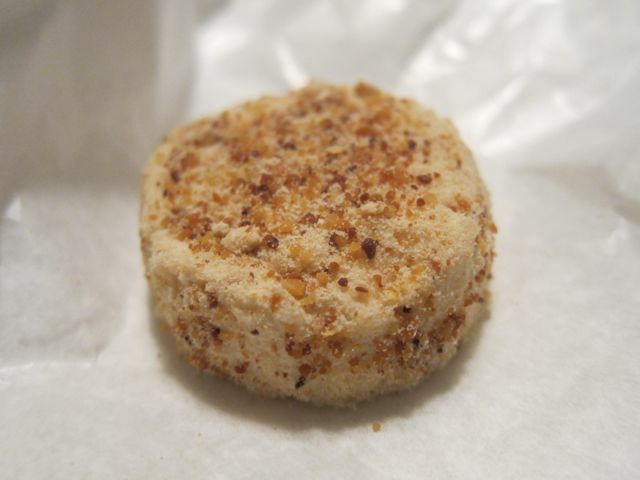 It sure looks fairly straightforward, either a chocolate or dark coffee macaroon, but once you bite into it, you get a very unusual, perhaps even gamey? taste at the end. Well, that’s pig’s blood. 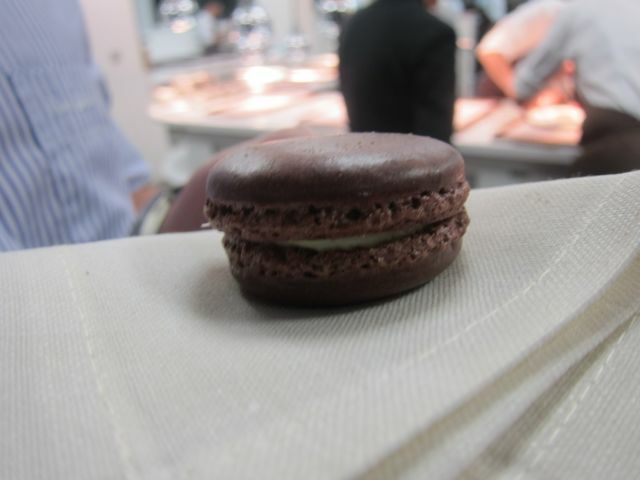 Yep, a pig’s blood macaroon with a blue cheese filling. 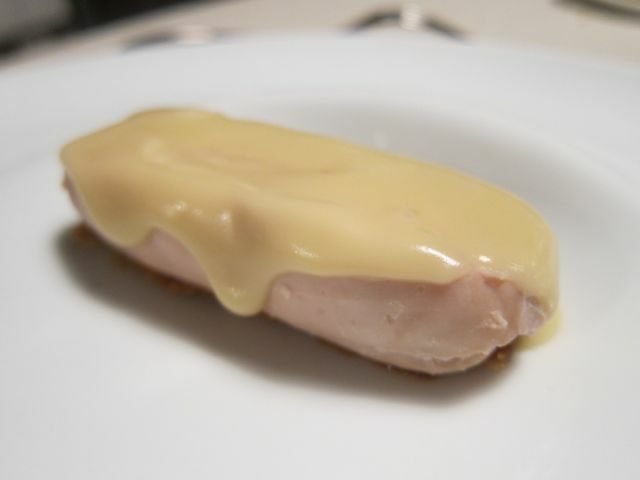 Pintada: Guinea hen cooked sous-vide over crispy skin and creamy lobster sauce. 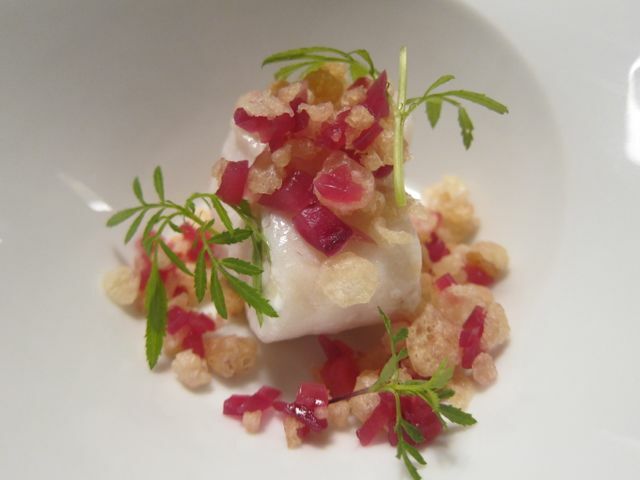 One dish that I was familiar with for many months in the kitchen. Great outcome. 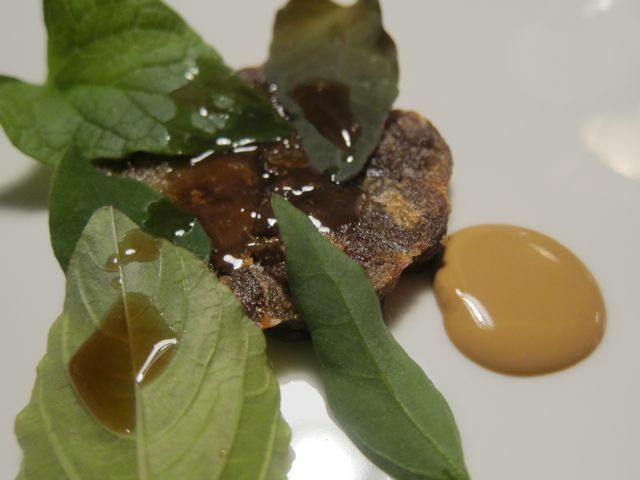 Secret spiciness under the guinea hen breast. 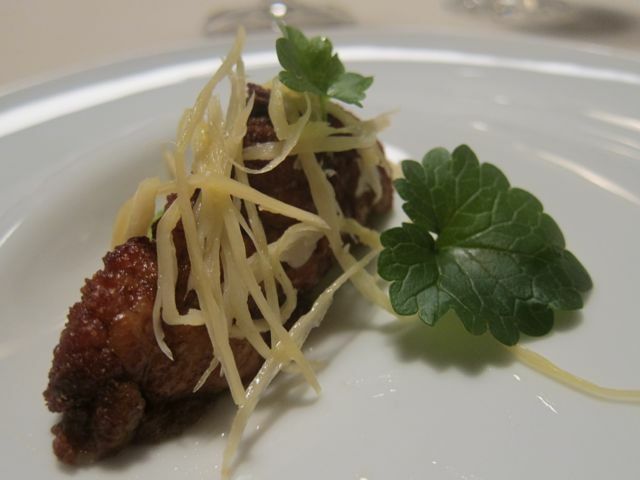 Molleja: Fried veal sweetbread with parsnip and hazelnut pate. 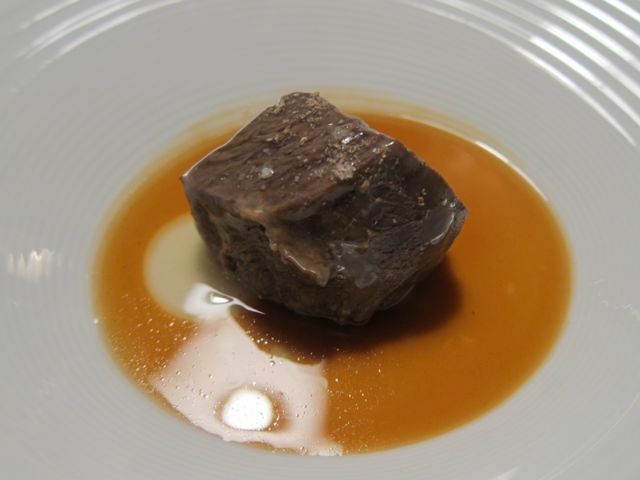 Carrillera: Beef cheek with pepper sauce. This was an extra dish of the night but it was worth it. 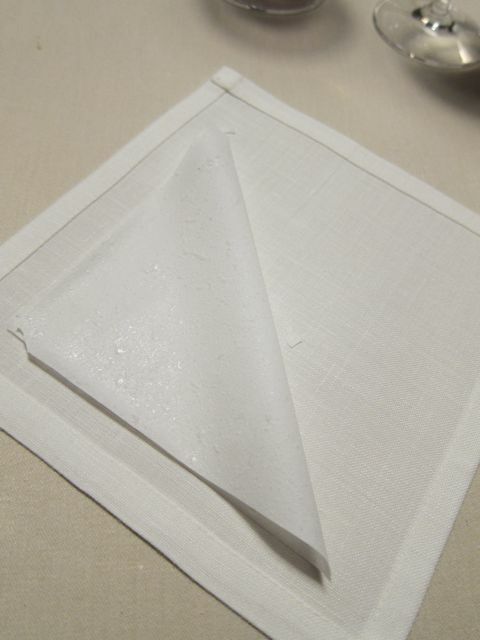 Servilleta: Napkin on napkin. 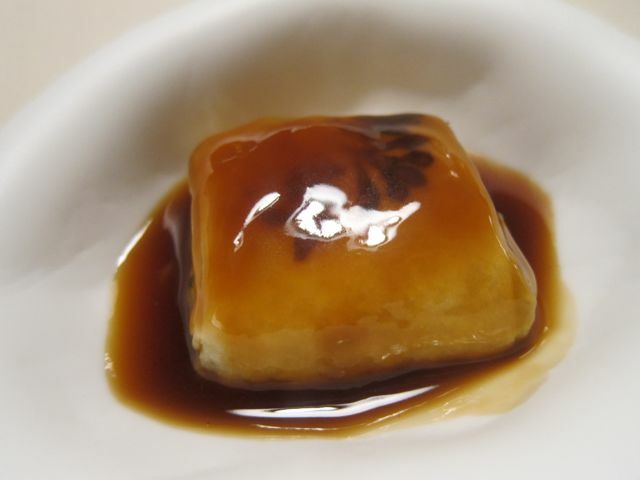 Served with a cream dulce de leche. Crispy and soft. 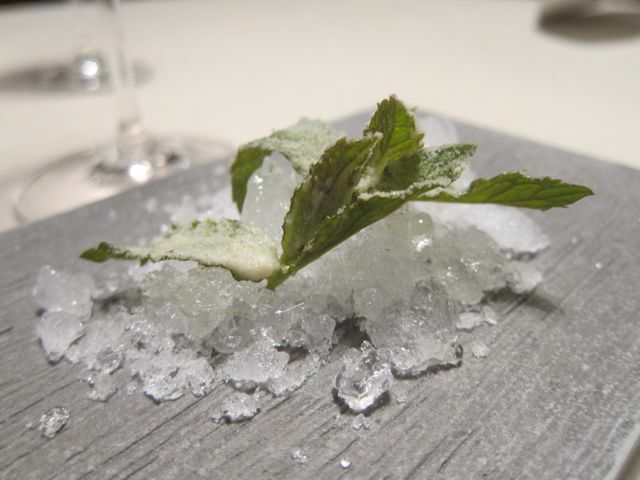 Menta (served on a bed of crushed ice, fresh mint leaves sprinkled with xilitol). Great palette cleanser. 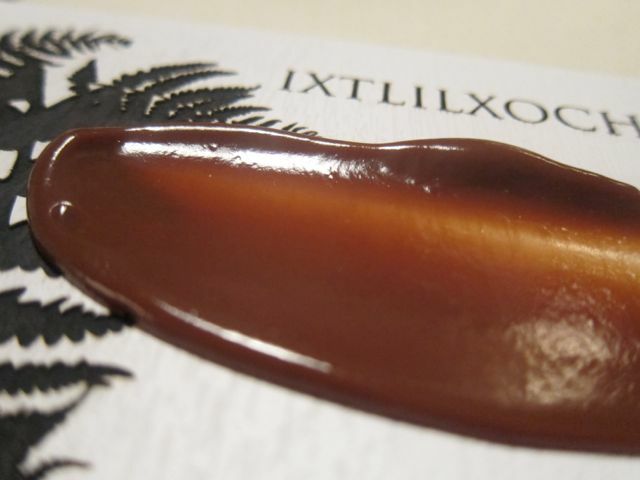 Vainilla (Vanilla made from fiddlehead ferns – served with vanilla sugar and a chocolate – caramel ganache). Has to be a classic. 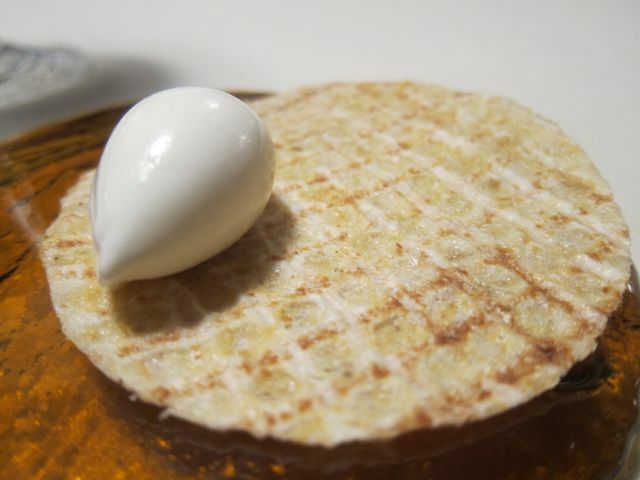 Barquillo (Toasted ice-cream cone with lemon ice-cream). 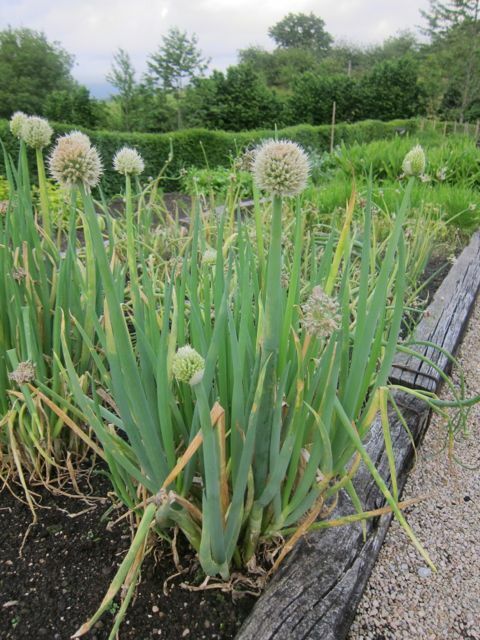 The flattened cone reminded me of when I was a child, keeping the bottom of the cone last to eat. The lemon ice-cream was refreshing, wished there was more. 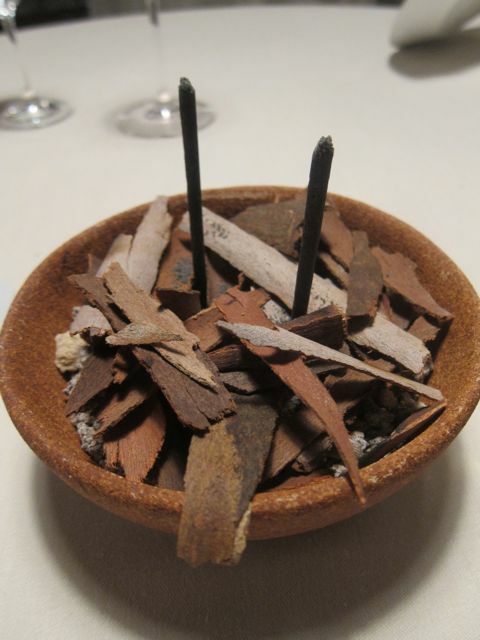 Incienso (Edible incense and sands; made with eucalyptus powder). As the waiter holds this bowl with 2 hands walking through the dining room, fellow clients can smell burning eucalyptus bark. I had no more room for coffee or chocolate-covered hazelnuts. It was so fulfilling and so satisfying both mentally and physically. Physically, because it was a meal that met all my expectations and much more; mentally because I felt proud to be part of such a team that excels by doing what it does best: focusing on natural and fresh ingredients, playing games with the dining room, making clients emotionally connect with dishes and most importantly, bring diners on a journey through the past, present and future by evoking each dish through a particular story, a particular path. 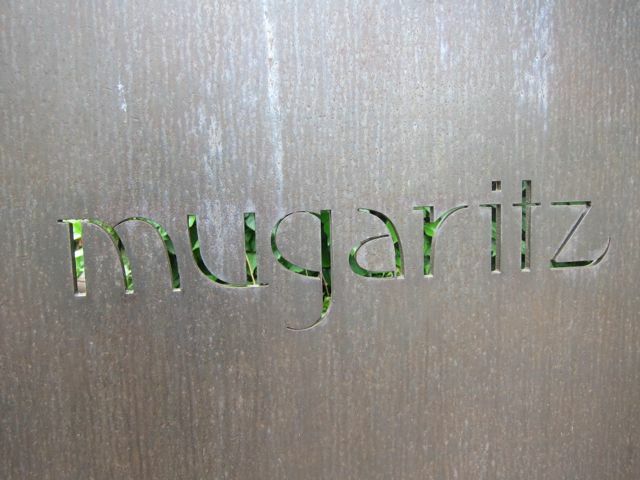 Thank you to the Mugaritz team to have invited me into their world, for having learned more than I ever could have, and thank you to all my colleagues for being such an inspiration to me. A fantastic meal that I will never forget. 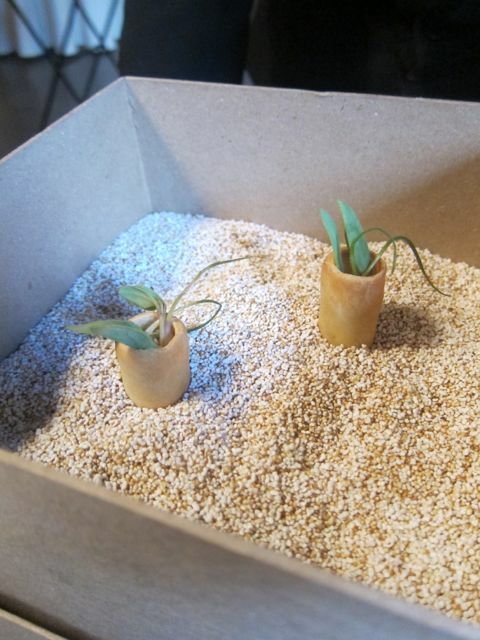 Congratulations on your experience and thanks for this beautiful post! Where to now?